Laura Ruiz – Essex Realty Management, Inc.
Laura Ruiz wears a number of hats at Essex. In her role as Operations Manager our clients and employees benefit from her immense knowledge of all aspects of property operations including budgeting, financial reporting, and many other areas of our business. Ms. Ruiz also works with all employees to help insure consistency by clearly communicating and updating our policies and procedures. Additionally, she services as Regional Manager for our Ventura and Sacramento management teams. Ms. Ruiz has an extensive background in property management and has been in the real estate industry for twenty years. Prior to joining Essex in 1998, she was employed as a Senior Property Manager by Insignia/ESG, Inc. Her duties included the oversight and management of a 1,000,000 square foot portfolio consisting of low and mid-rise office buildings located throughout Orange County. 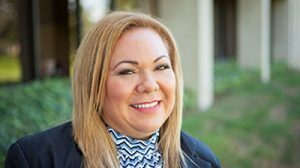 Ms. Ruiz is a licensed California Real Estate Sales Person and is affiliated with both the Institute of Real Estate Management (IREM) and the Building Owners and Managers Association (BOMA).